Space Rock, a tag that is as wide as many music resources are in place. The equation becomes even more complex as sounds are constantly processed through distortion pedals, and voices are modified and tend to be extended in one note to then fade away. A combination of sounds that would make you turn your head towards the sky and imagine the soundtrack of an astronaut, or maybe of astral projections. 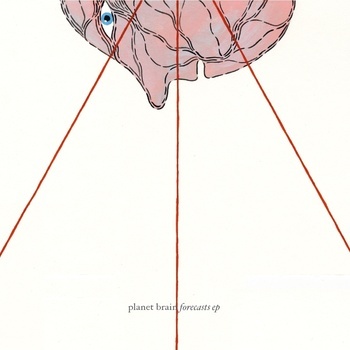 Talking about Space Rock, there’s a quite interesting proposal called Planet Brain, a band that released an EP called Forecasts in October 2011. Six songs permeated with different styles can be expected from this material, but have always the constant value of guitar distortions. The journey starts with ‘At least Since Monday’, a track opening with a strange sound of a radio transmission, giving to a nice riff of guitar time and room to breathe and create its atmosphere in any organic way, then guitars merge and let vocals take the lead. All sounds start and their ideas are independent and perfectly distinguishable, with well-defined personalities. It’s the above mentioned feature one that becomes a signature of the band, as songs develop with individual formulae for each instrument to then melt through echoes and sounds prolonged, creating a sensation of physical space and arms wide open, purely like being in the open. This is the part that would really bring comfort and relaxation to your poor troubled soul if you hate crowds but have to be in the middle of one, then you just play “Believe November Slowly” (track no.3), and your vision will change automatically. I loved the chorus in this one, as it is ascending and maintaining its magic to the last inch of this road. Track number 4 is the one the band has chosen as single and has a video of its own. Two words to describe it: Pure magic. The name of this piece of heaven is “Forecast #1: Why Bother”. The heavenly effect is definitely courtesy of the guitars distorted and anger in the chorus, but then giving echoed sounds like being inside a church in the verses of the song. It delivers a nice ascending feeling almost after the middle of the song, with iterative riffs that go in crescendo, preparing your ears for the final explosion, but giving twists in every corner of the track. Drums are definitely the firm ground of this band, full of syncopate and irregular beats as it is not a snare-drum based sound, and takes a deep look and exploration to every element available there; cymbal riffs become a watermark of this band as well, as they create unconventional sequences that would close a riff through the less expected sound. Irregularities, quick sand, despair, and then order. This is the picture given by the last track, ‘Forecast #6: There might be Sharks”. The second part of this one is completely genius, it delivers a syncopate bass line (lovely figure there!) and still manages to glide. Tracks 2 and 5, ‘Yesteryear’ and ‘Forecast #2: Send Me a Souvenir’ are the two tracks having different descriptions by themselves, as track 2 would bring me images and sounds of the like of ‘The Joy Division”, which might be a different context to the space rock I have described above. Track five could become the “heaviest” track of this album, as guitars become more dense and deep, giving nice alterations reminding of the sound of machinery. The spiral effect delivered through the sounds of guitar is just mind-blowing. There are times when it’s not possible to remove that final stitch that keeps us on the ground, when all we need is a getaway or the feeling of looking beyond. This EP will definitely unstitch you and let you know there’s also an unexplored blue heaven in the middle of this grey landscape. Planet Brain Bandcamp. Facebook. Twitter. Posted in Apocalyptic stuff, reviewsTagged Forecasts, Italy, Planet Brain, RockBookmark the permalink.